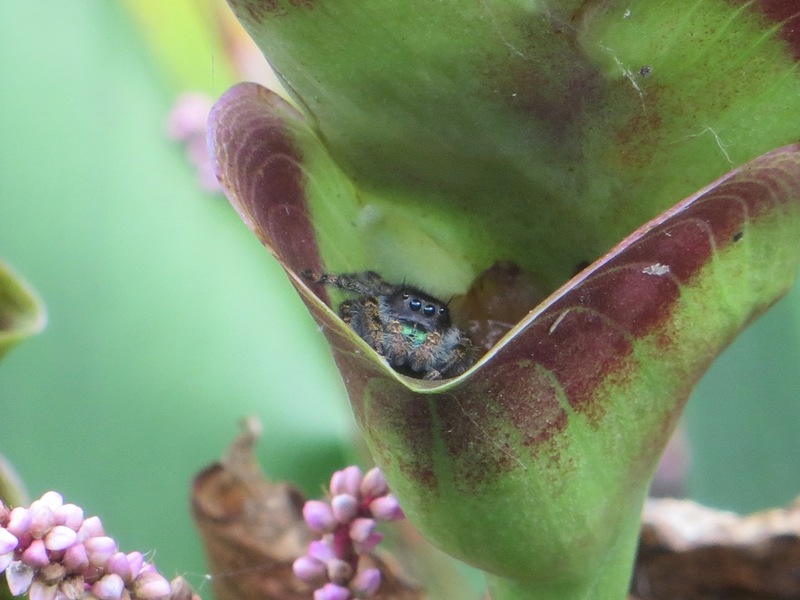 Sitting snugly between the layers of a flowering plant sat a little spider, intently peeking out. Momentarily, it ducked behind the layers and out of sight. I never thought I’d say a spider looked cute, but it does. I might have written that quotation – I am no spider or centipede fan, believe me! Ha! I’m not fan of spiders either — don’t want them anywhere near me. I hear you. We’ve had so much rain the last week and I thought to myself “thank goodness no spiders or centipedes” then I had a centipede in my bedroom, right after I woke up. I was horrified to know it’d been there all night. I got a shoe and whacked it on the wall, but missed it by a hair and it ran … fast … under the dresser. I later saw it in the bathroom and still on the move, but stepped on it in the hall. I only hope it was the same centipede taking a tour of the house and not three separate ones. I’m always horrified when I miss them, and I dance around trying to determine the best angle for attack before I whack ’em. I’m not calm about it at all. It’s nice to share my horror of creepy crawlies with someone else who also dislikes them. is that a Pitcher plant? I wasn’t familiar with this plant, but I don’t believe so. It had several of these up and down the stem. probably not but it does kind of look like one.You might find this interesting. They are interesting plants, and by the sound of it, not very kind to insects. I’m glad these don’t come in people size. but you could get rid of bad people & there appears to be plenty of that going around these days!